VA Form 0730b or the "Child Care Provider Information" is a form issued by the United States Department of Veterans Affairs. 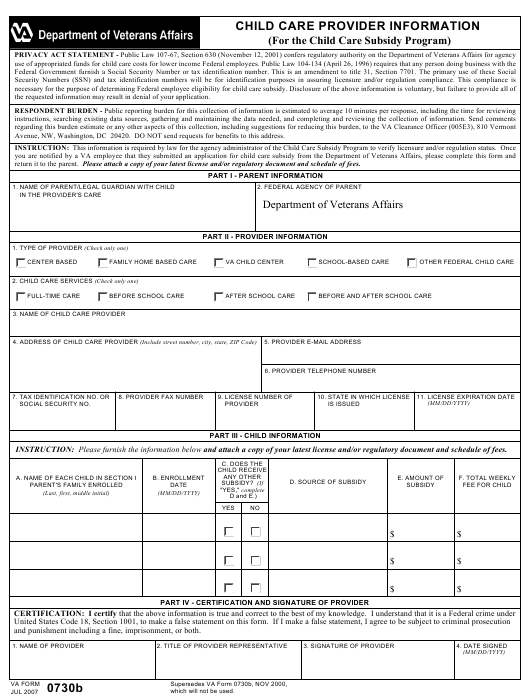 The latest fillable PDF version of the VA 0730b was issued on July 1, 2007 and can be downloaded down below or found on the Veterans Affairs Forms website. the requested information may result in denial of your application. Avenue, NW, Washington, DC 20420. DO NOT send requests for benefits to this address. return it to the parent. Please attach a copy of your latest license and/or regulatory document and schedule of fees. INSTRUCTION: Please furnish the information below and attach a copy of your latest license and/or regulatory document and schedule of fees. and punishment including a fine, imprisonment, or both. which will not be used.